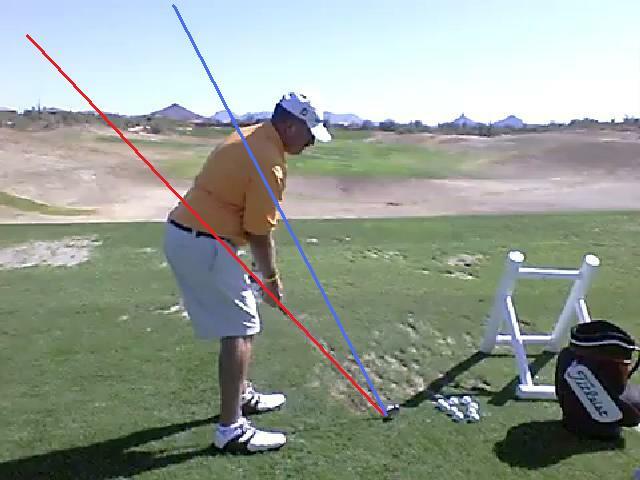 A swing plane is basically the path that the club head follows during the swing. 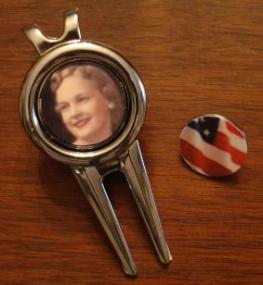 Ideally, the club's path stays on a single swing plane, as again the goal of the golf swing is consistency. If the club "changes planes" or swings on more than one plane, it is more difficult to be consistent. Very few good golfers swing the club on a "single plane." 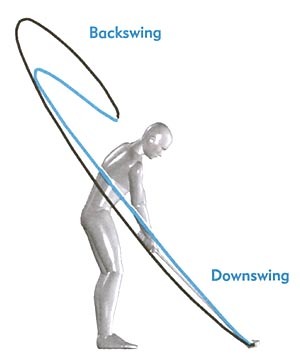 For most, the downswing plane is a little flatter than the backswing plane. 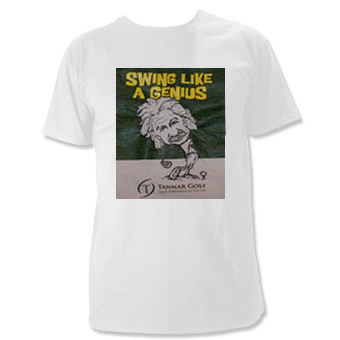 Ben Hogan was the golfer who first made the concept of swing plane worldwide in his classic golf instructional book, "Five Lessons." 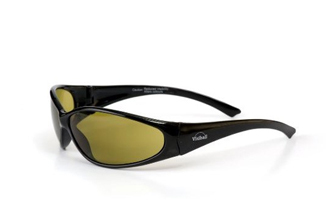 His vision was swinging the club so that his left arm followed the inside surface of a pane of glass. He didn't want golfers getting to upright. Ben Hogan had a relatively flat swing plane. 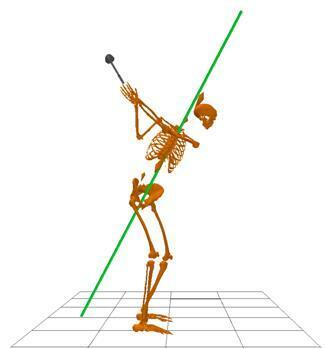 Many professionals today have a much more upright swing plane. The basic goal for a consistent golf swing is to swing the club on approximately the same plane both on the backswing and downswing. To help swing the club back and through on the same plane one must maintain a constant spine angle. The spine angle is the angle at which the spine is tilted towards the ground. 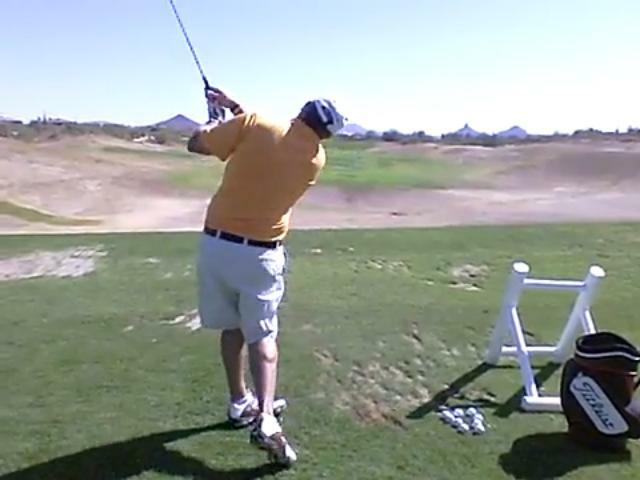 The body must rotate about a spine that doesn't tilt more or less during the swing. 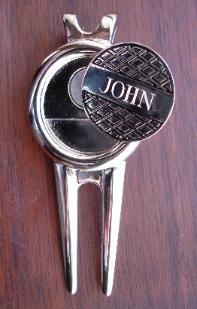 When swinging the club, one wants to keep the hands, arms and club on the same plane. 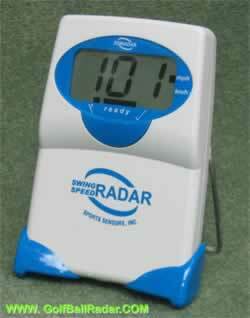 To help understand what this means, visualize the set-up as in this photo. The blue line is called the shaft plane. 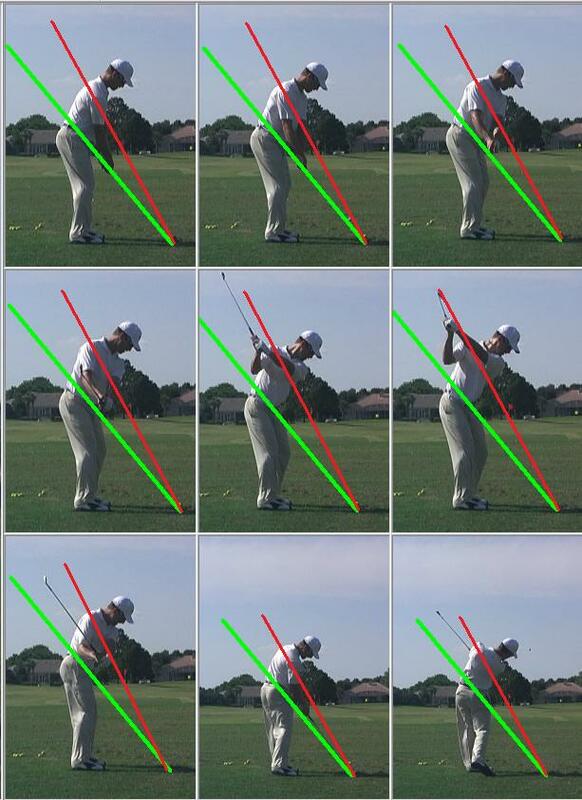 The red line is called the right shoulder plane. 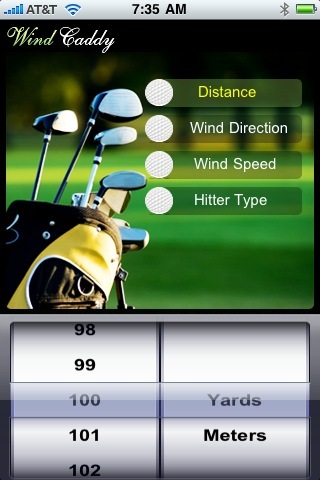 Ideally, as you swing the club, the hands stay in between the two lines. 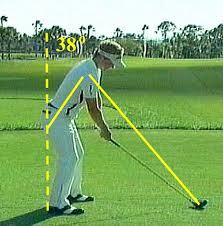 Many amateur golfers will start the downswing with the arms and hands, which brings the hands outside the red line, and thus an outside to inside swing path, causing a slice. Some good players' hands get slightly outside the blue line at the top of the backswing, but they then drop the hands back to below the blue line in the downswing. Observe the positions of the hands with this golfer's swing (outside to inside swing path and a slice). Photo 2: At the 9 o'clock position, the club is not parallel to the target line as it should be; the hands or moving below the red line. Photo 3: At the top of the swing, the hands are just outside the blue line. 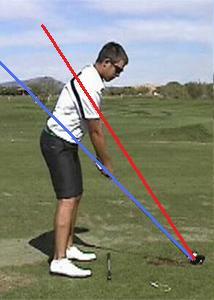 Photo 4: Starting the downswing, the hands are moved outside the blue line. 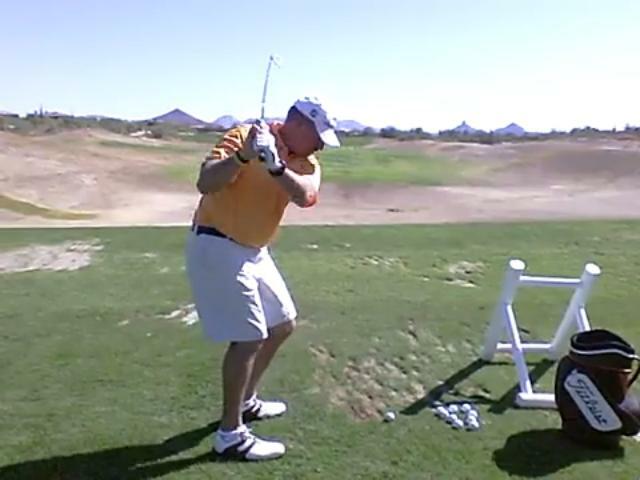 Note that there has been very little motion of the lower body, meaning the downswing has been initiated by the hands. Photo 5: The hands a club are both well outside the blue line. 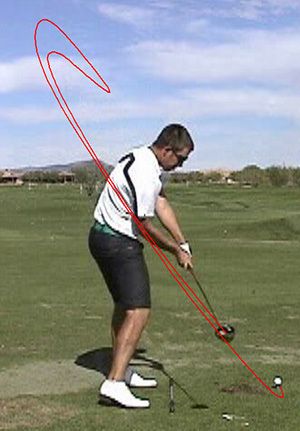 The swing path is severely outside to inside, resulting in a slice. Photo 6: The hands are moving inside the blue line. Want to view other lessons in this series thus far. Click on the link below.